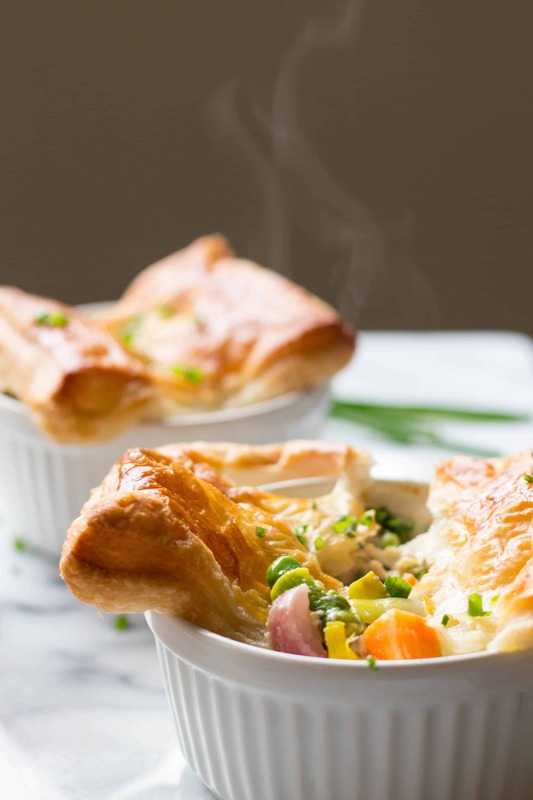 These Spring Chicken Pot Pies have All of the Spring Veggies, Tender Chicken, and Crisp Puff Pastry. Easy spring recipe! I’ve been wanting to write a post about kitchen failures for a long time. I’m not talking about under seasoning a piece of chicken or overboiling an egg. I’m talking epic failures. The ones where you spend days shopping and prepping for a recipe, only to have it completely flop, with absolutely no shot at redemption. Yup. They happen. And they happen to everyone. Chefs are no exception. It’s just easier in a restaurant kitchen to pass off your mess to a dishwasher, head to the walk-in, grab a new batch of ingredients and try again. I spend a lot of time planning, styling and editing to make everything on this blog appear so effortless and beautiful (sidebar: it wasn’t always beautiful). But the truth is, it’s far from effortless. I mess things up as much – if not more! – as I get them right, and it’s about time I let you know. 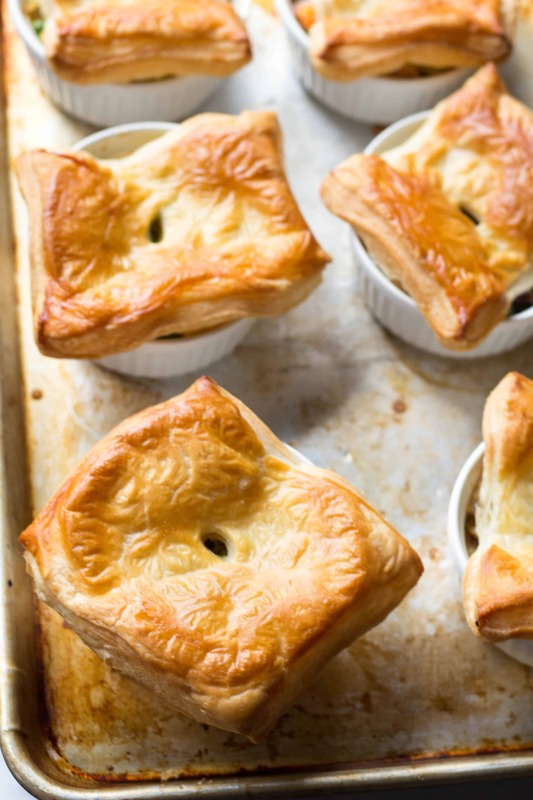 These pot pies? They flopped. And I was pissed. Those were perfectly good vegetables that I ruined. And I shelled out $12 bucks for that fancy all-butter puff pastry! We ate them anyway, because I refuse to waste food unless it’s reeeaaallly bad, and these were at least still edible. But I hate-ate them. I became more annoyed with every bite. 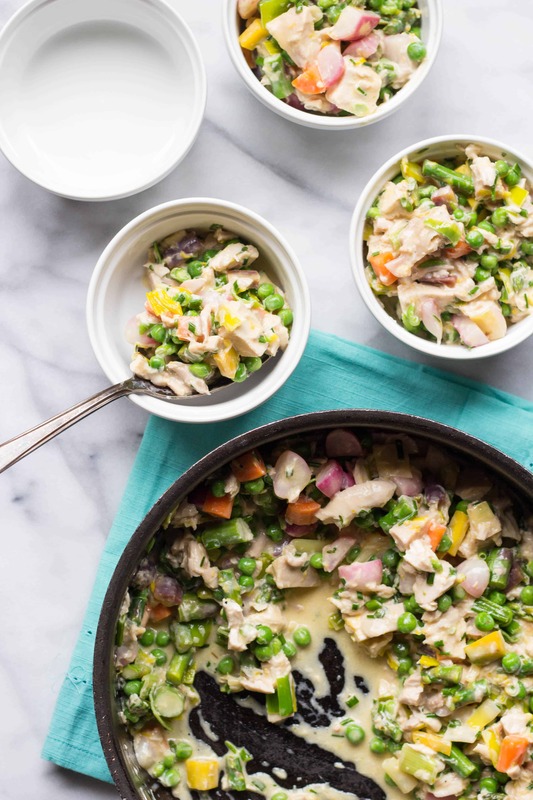 You see, what had happened was… Since this was supposed to be a “spring” chicken pot pie, it needed to be much lighter than my classic, a fall staple. I set out to make the filling luxurious and creamy without being heavy. I opted to forgo the usual roux based veloute and just melted in some mascarpone cheese instead. I tasted the sauce, and I loved it. It was exactly what I was going for, but I worried about the consistency after baking. I wondered what I could use to stabilize the sauce without compromising it’s light texture. “I know! Egg yolks!” They’ll add body and richness and will hold the sauce together in the oven. So I stirred them in, filled the ramekins, topped them with pastry and baked those bad boys up. Chaser insisted they didn’t taste so bad. And really, they didn’t. The flavors were spot on. The chicken was moist, the vegetables were perfectly cooked, and the pastry was buttery, puffed and crisp. It was just the texture of the “sauce” (I can’t even call it that) that was so off-putting. The pictures still turned out lovely, though. You’d never know that’s a really funky filling in there, would you? That’s the funny thing about food photography. Just because food looks delicious doesn’t mean it is. Sometimes what you’re looking at is actually made of plastic, or it’s a pot pie with a mix of egg chunks, oil and water pretending to be a sauce. The good news is that I got back on my horse and corrected the recipe a few days later. Turns out, you do need a roux, and the egg yolks are just bad idea jeans. 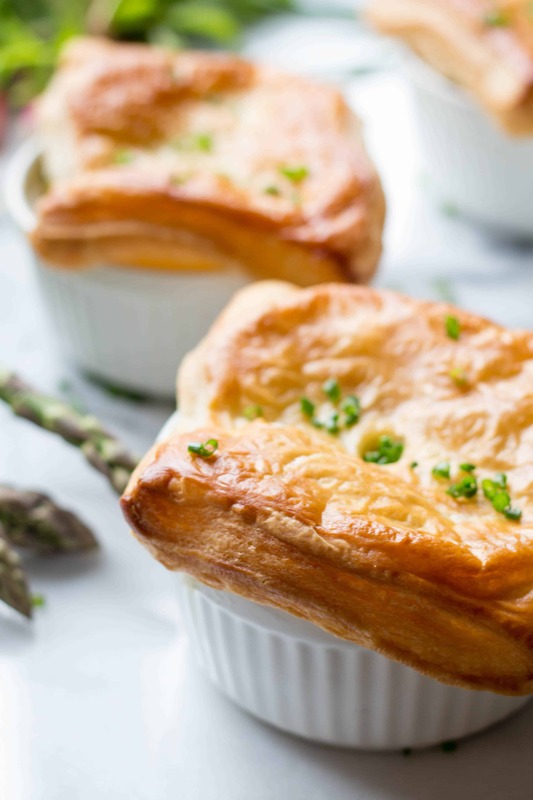 I love a classic pot pie, but this version is the one you want to be eating right now. 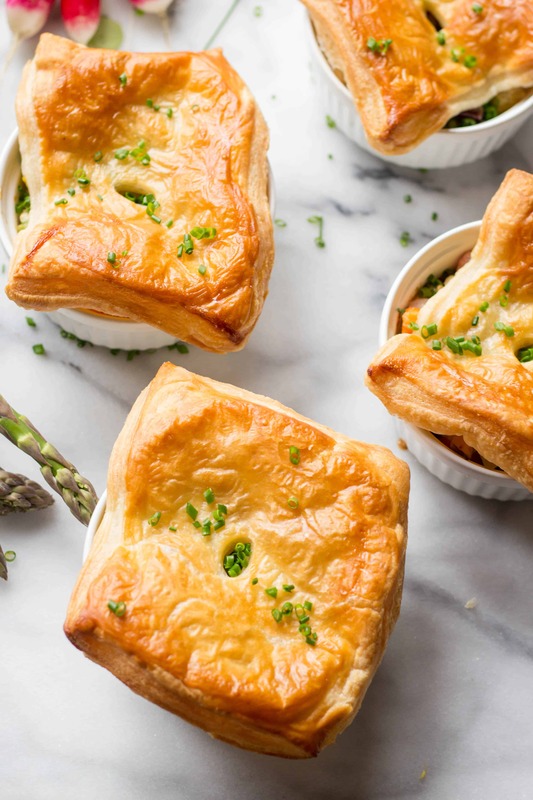 The best spring veggies, a light and silky sauce, tender chicken and a hit of lemon and chives to wake it all up, with just enough crispy pastry on top. Summer is right around the corner and we don’t need to be filling up on all that extra crust. Plus, buying pastry from the store, as opposed to making it from scratch, leaves much more time for digging in the garden. …You are planting a garden this summer, aren’t you? We can talk about garden fails another time. I have lots and lots to share about that. Failure in the kitchen – and in life! – is inevitable. Don’t let it intimidate you. Look for the lessons. They’re always tucked in there somewhere. 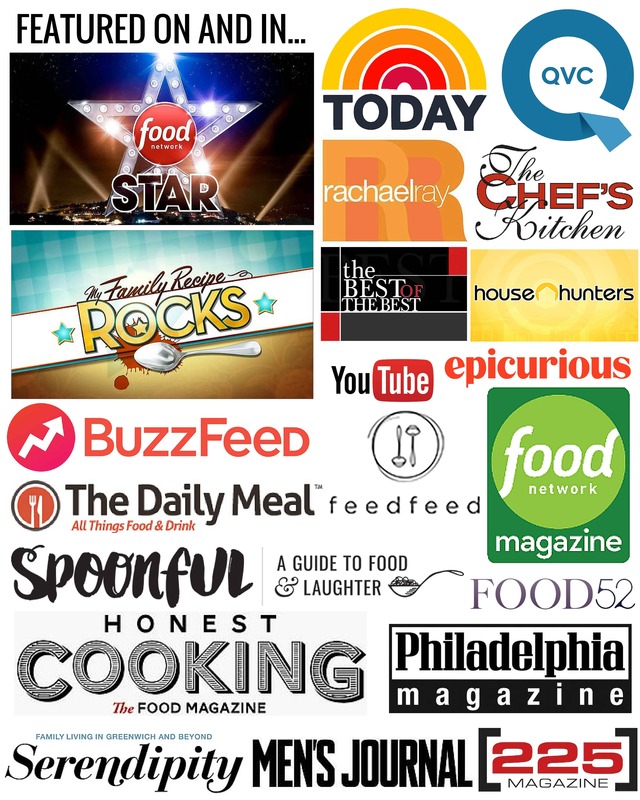 You can only learn so much about cooking from a text book or a video. You have to try, and you have to fail. How else would I have known that a sauce of mascarpone and egg yolks would turn into a curdled disaster? Even though I’ve failed over and over again – and I know I’m never going to stop failing – it’s still hard to accept sometimes. Failing can feel like a big ole waste of time. But it’s not, as long as you look for the lesson. When you think about it, the failures are actually far more valuable than the successes. It’s all about perspective . Preheat the oven to 375 degrees. Heat the butter in a large skillet over medium heat. Saute the leeks for one minute, add the carrots, and saute for about two minutes more. 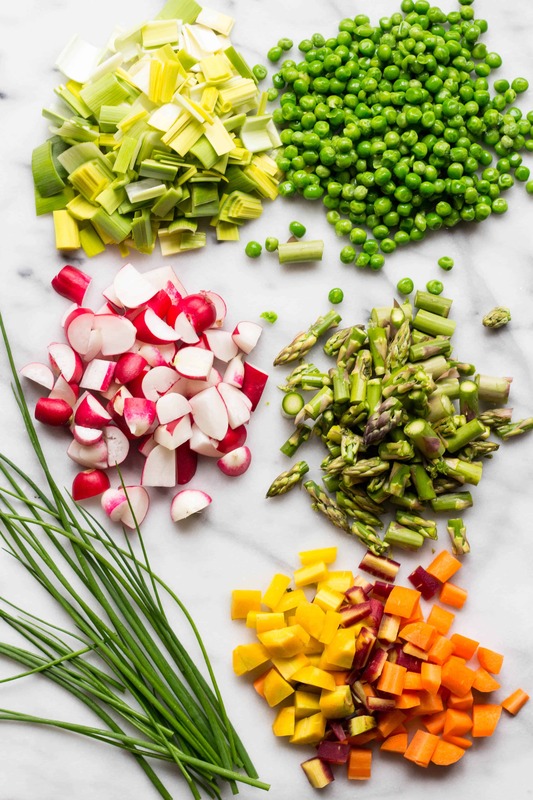 Add the radishes and asparagus and saute for one minute. Sprinkle flour over the vegetables and stir until evenly distributed. Add the chicken stock, turn the heat to high, and stir until it comes to a boil and starts to thicken. Season with salt and pepper, then turn off the heat. Stir in the mascarpone until it’s fully melted and incorporated. Gently fold in the chicken, frozen peas, lemon zest, lemon juice and chives. Taste and adjust seasoning as needed. Divide the filling amongst 6 small ramekins. Dust a work surface with flour and roll out the puff pastry to even out any folds and make it slightly thinner. Cut the pastry into 6 squares and cut a slit in the center of each. Place the pastry squares over each ramekin, pressing down gently around the lip and letting the excess fall over the sides. 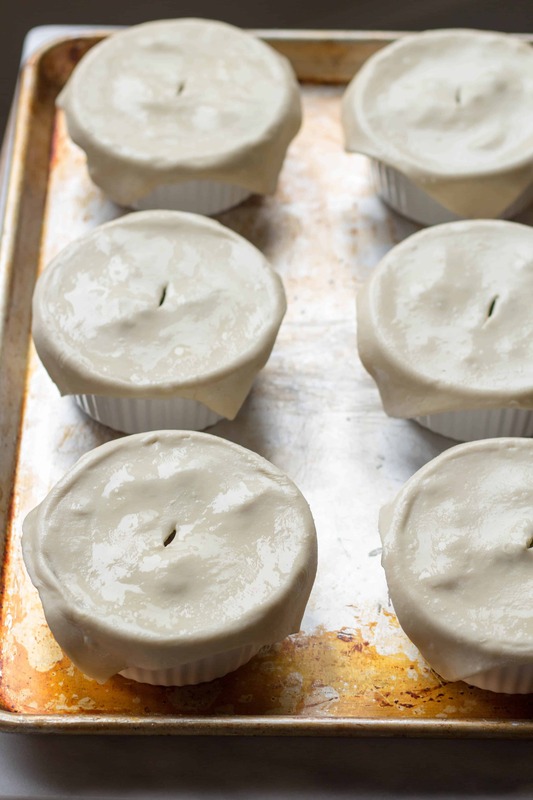 Brush the tops lightly with egg wash, then place the ramekins on a large sheet pan. Alternatively, you can pour the filling into a large casserole dish and place the whole sheet of pastry on top. Bake for about 30 minutes, or until the pastry is puffed and golden brown. 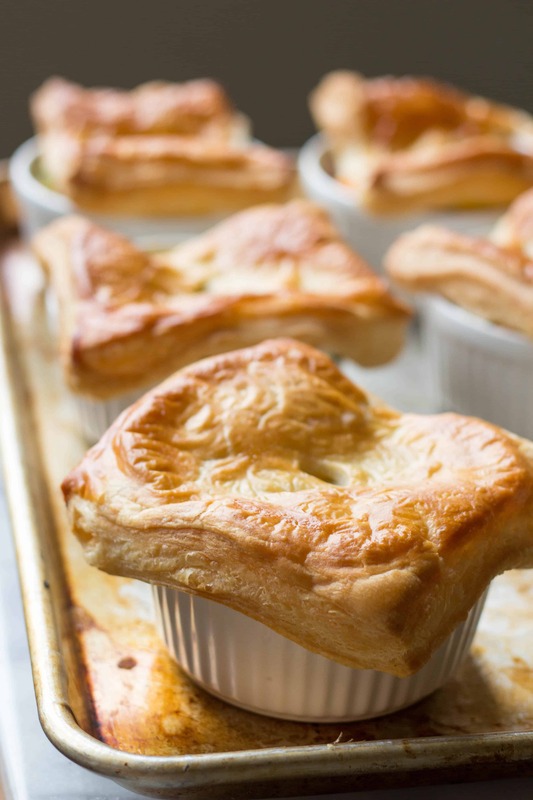 Allow the pot pies to cool for 10 minutes before serving. C: Having cooked in a restaurant and later being an ultra-competitive home cook whenever my sister and I got together (she is a natural, the bee-yatch. I went to school and she has better instincts!) I smiled all the way through this post. Now at my age, I simply love to cook. And I still screw up far more ‘good ideas’ on the first, second, fifth try then I get right. (Q: like how many nights in a row can you make a simple pan roasted scallop on a bed of cilantro and fresh corn puree with a bacon, chive, lemon gremolata before you get it right? A: at least six.) I remember the first time we tried to do a duxelle for Wellington and it was total crap and we could never figure out why. You just hitch up your apron and soldier on. I think it is really cool that you are (wo)man enough to say this out loud. Good for you! You know, I’m reminded that I was lucky to get reservations to Charlie Trotter’s some years ago and as a courtesy they took some of us on a tour of the kitchens. Yep – bad dishes (or dishes that the chef expediter did not like) were being tossed and they started from scratch. Food ain’t science as much as it is passion. Stay passionate, girl. Thanks, Bruno! It’s so true. I’ve had similar fails on so many occasions, and have wanted to write a post about it. It wasn’t until now that I actually had some decent photos to go along with it! Great idea! 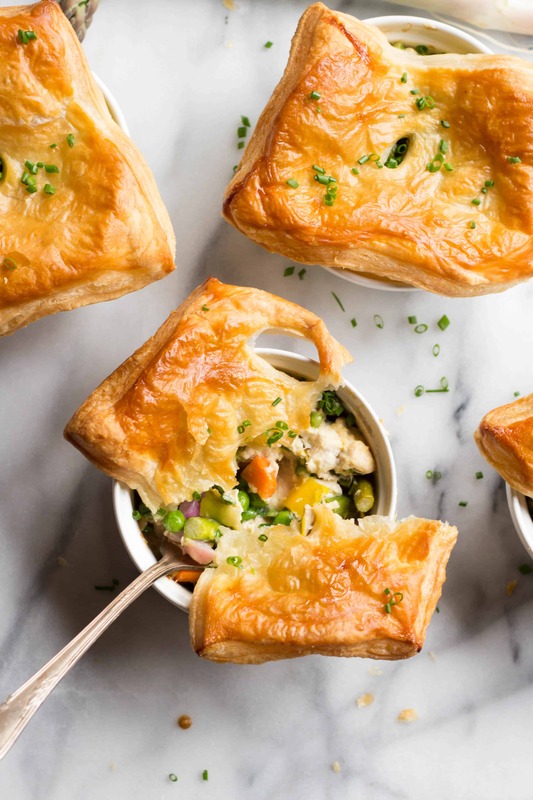 Definitely a refreshing take on chicken pot pies!